Treadmill Trainer our favorite treadmill running program. The best way to plan a treadmill running program, is to include all types of workouts to make it interesting and enjoyable. There is nothing more painful and exhausting than a boring workout routine. Most people think a treadmill is only designed for running and walking, and therefore, is boring and can not be enjoyable. Actually, that is a misconception. You can combine hill training, interval training, speed training, consistent pacing and easy runs. Combine all of these in one workout routine and you can have an enjoyable treadmill running program. Treadmill interval training is a great way to burn fat and improve your fitness level. Whether you are running outdoors or on treadmill, the best way to improve your running performance, running power, and aerobic endurance, is by interval training. If you want to burn calories in a short time workout, then interval training is the one. What is so good about treadmill interval training, is it is hard at first, but once you get the hang of it you will be laughing, especially when you come back to running on a level surface. Treadmill interval training is great to do on treadmills, because it will force you to maintain the pace by keeping up with the belt. The only way to slow down is to reduce the speed. This type of speed training and pacing makes treadmill training a higher quality workout session than outdoor training. Every treadmill running program should include easy runs. Easy runs is the recovery period of the workout routine. This is where you give your body the time to rest. You can't run fast and hard all the time, because your muscles need time to rest and recover. In every treadmill workout routine, you need a recovery period and that is why easy runs are so important; to allow your body to recover from intense, hard and long running sessions. We all know how hard it is to run at a constant pace, without getting discomfort or tired. That is why it is very difficult to run at a pace easy enough for all of your muscles to recover. An easy running workout is great for beginners to strengthen unused tendons and muscles, before doing hard workout routines. Hill training is a great way to strengthen your calves and burn calories. This type of workout is used to build running strength. Treadmill hill training is great for a treadmill; a treadmill running program without hill training is not a good workout. That is why every treadmill running program should include incline/hill training. You can easily use incline from 1 to 10% and challenge yourself. We all hate climbing hills or doing treadmill incline training, but they great for burning calories fast and increase your heart rate. The Treadmill Trainer is a Mp3/Ipod workout routine that will help, motivate, guide and encourage you every step of the way. If you ever wanted to be a runner or want to take your running to the next level, then this audio workout program will help you run faster, further and longer than you ever thought you could. 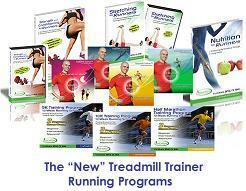 For home treadmill users, it is hard to guide yourself and instruct throughout the workout session. Studies have shown many treadmill users get bored and lose interest soon after the excitement dies. This is due to a lack of guidance and not knowing how to use the treadmill to its potential and achieve your goals. That is why every treadmill user should get Treadmill Trainer. It is a must have, if you are going to train on a treadmill or do outdoor running. It will not only motivate you, but most importantly, you have your own running partner that knows what you need to get out of your treadmill running program.